And... I’m back in Bogotá! After a long trip from Salento... At Pereira Greta and I take diferents directions. And at the afternoon Alex and Stella collect me with Carlos to go on the road. The Muricio was with Natalia and Gladys. We are a good bunch! Three hours to arrive in this charming town of Villa de Leyva, known for its cobblestone streets, colonial houses, restaurants and its location within the valley. First, look for accommodation and leave the baggage. Under a light rain we find la Española Hotel, a cozy hotel close to the huge and pleasant Plaza Mayor. And to have some Margarita’s at the Plaza! At the bus station in Medellin I say goodbye to Greg and Marie. Medellin is a good city. When we arrive in Cartagena we look for accommodation with Greg and Marie, near the walled city. We find what we look for, economic and well-located. In the morning I take a walk around the walled center. I love it! Narrow streets and colonial houses with well-preserved courtyards, cafes, shops and walls ... although be very different, the rhythm is similar to the inside walls of Tarragona. 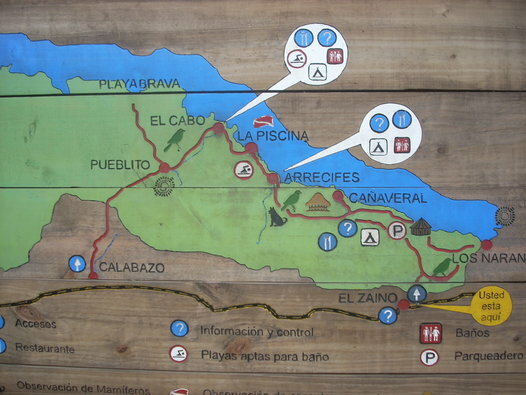 From Santa Marta we take a bus to the last cuatrovias before Rioacha to take a Collectivetaxi till Uribia from where a transformed Pick Up to transport people and materials goes to Cabo de la Vela. Here there aren’t many things to do besides watch the calm it exudes. We find a family that has accommodation rooms 3 meters from the sea in a very affordable price ... the marriage is also leading the restaurant, they are friendly and great cook. The first day, after the magnificent sunset, we eat "lobster in garlic" with a few beers from Venezuela (so close to the border, there is a lot of smuggling). Great! A swim in turquoise water to start the day, waiting for an arepa with oats and a tinto(coffee) for breakfast. We walk to the piles of sugar, a sacred mountain with a pretty beach and that the road is over a pond full of birds. The sunset view from the lighthouse is only 45 minutes walk from the village. I decide to stay a day longer than I planned. To do Not do anything besides read, sleep and swim. Before the latest garlic lobsters for dinner, we ran to the Lighthouse with Greg and Marie ... I love it! In the morning (5am) we take the Pick Up to get back to Santa Marta. The journey from Copacabana to Puno has been very long ... 15 hours throught secondary roads bordering the north of the Lake Titicaca. We stamped out of Bolivia in Yunguyo. We could not get the stamp of the entrance to Peru... the immigration office was without electricity. At the border that we realy cross, we changed the bus, and divide all of us in one van and one bus that will take us to Juliaca. I had to go in the van. We were much faster than the bus for these bads roads. When we arrived at Juliaca we find the road blocked with stones on the road. The driver tried to go across the fields until he reached the next bridge that gaves access to the city. This bridge is blocked by hundreds of farmers protesting for the mining companies that wants to install factories on their land. Fish! Trout for dinner at the sea front and sunset on the Lake Titicaca for the background. I found a very affordable and decent accommodation. In the morning I go by boat to Isla del Sol. I left almost three-quarters of the backpack at the hostel. I feel light. I download the second and third book of the trilogy of Stieg Larsson in English and epub format, and together with Calibre program you have an Ebook in your computer. In the following day, after breakfast we go to walk La Paz. We go to Plaza Murillo and then we split to go to the lookout of Killi Killi. I’m going walking and the Ana’s try to go by bus. I wait twenty minutes and then I keep going to visit the city. I love Calle Jaen! Narrows streets with houses and museums that make this area very quiet and relaxing. The path to Rurre is long way unsalted. This goes on a side of rivers and lagoons, crossing the savanna and parts of the jungle. At the bus I start to read hardly the book in English “The Girl with the Dragon Tattoo”, the first volume of the trilogy of Stieg Larsson. I started few weeks ago but I didn’t read more than a chapter. It’s dark when we arrive at Rurre, we find the accommodation Alojamiento Japón, that for 25B per person we have a room with private bathroom.